The Westin Ka’anapali Ocean Resort Villas North is the beautiful addition to the original Westin Ka’anapali Ocean Resort. Select a spacious studio, one-bedroom, or two-bedroom lockoff villa, and choose either an ocean view or island view. After full days of exploring the island, you can come home and relax in your timeshare at Westin’s Villas North. Soak in the oversize whirlpool tub or kick back on your private lanai. Enjoy family meals in the kitchen, and then watch a movie together. The Westin Ka’anapali Ocean Resort Villas North consist of buildings 5, 6, 7, and 8, and each building is angled so some of the island view units even enjoy ocean views. Oceanfront units in the Villas North do not all have direct oceanfront views. 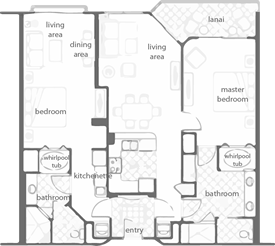 Click on the links below to view the details and floor plans of each unit type at Westin Ka’anapali Ocean Resort Villas North.